If you were wondering whether The Witcher 3’s New Game+ mode makes the game harder, I have some good news for you: It does! New Game+ was just added to Wild Hunt as the last of developer CD Projekt Red’s free post-release downloadable content. It’s a cool final addition, since many people (like me) have finished the game and might want to try it again and make different decisions. And maybe see if they can keep from screwing it up with Triss and Yen this time. I fired up a New Game+ (here’s how you do it) and selected “Blood and Broken Bones” difficulty again, which is what I played the game on the first time. I played through the prologue, then found myself standing by the fire with Vesemir. I had pretty much all of my gear, usable items, and alchemy/crafting items. You’ll notice I also had a fresh set of that snazzy-looking Kaer Morhen armor, and, interestingly, its armor rating has been juiced up to 160. It’s still not as good as my mastercrafted armor, but still a substantial improvement. All of the basic gear you find lying around has been improved in NG+, and the runes you’ll find lying around are of the “greater” variety. However, most shopkeeper stock is still low-level. The very first enemies you fight in NG+ are already level 31. The fights haven’t been all that tough, but they’re far from easy. I’ve been getting a ton of XP for everything, too—I got 630 XP just for beating up the guys in front of the bar in White Orchard. I earned three levels as I made my way through White Orchard, so players should be climbing through the 40s in no time. I’m assuming that difficulty increase will hold throughout. 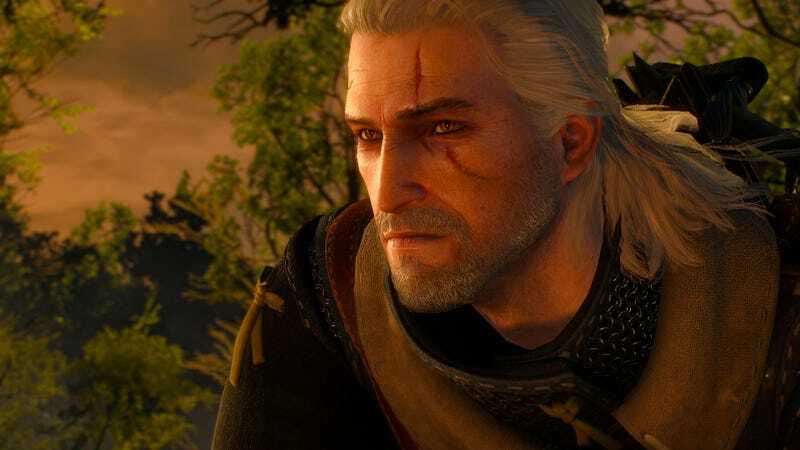 It sounds like there’ll be new “legendary” versions of the existing Witcher gear in the game, which should go some distance toward making the higher-level enemies more manageable. When I first started New Game+ I figured I might as well just stream some so that y’all could watch. The stream is over now, but you can watch the archived stream here. It went fine—only one unexpected death—and the enemies are definitely tougher. Update, now that I’ve played more: After a couple of hours with it, NG+ definitely seems like it’ll be a good time for anyone who wants the game to put up a stiffer fight. Enemies in White Orchard ranged from level 31 to level 36 for me, immediately matching and even occasionally surpassing my level. At one point I died from taking a couple of shots from a random Drowner, meaning I had to keep my wits about me at all times. It was cool, since at level 34-35 I hadn’t seen any enemies at my level in quite some time in the vanilla game. One important tip I’d offer to anyone doing NG+ would be to craft your mastercrafted armor and top-level potions before you start NG+, because your formulae and schematics don’t carry over. Your gear does, though, so as long as you’ve got the best gear crafted before you set out you should be all set. I’m not sure how much more Witcher 3 I have in me—I’ve played through the entire game twice now—so I probably won’t play TOO much more NG+. Still, it was fun to come back and find a much more challenging game, and I’d be curious to see just how much harder it gets once you arrive on Skellige. Thanks to everyone who tuned into the stream, and to anyone out there who plans to play through an entire New Game+, well, good luck.